Planning business expansion in a less familiar country like Thailand is a tough task. What can, however, make it easy is a strong data repository of business executives you wish to connect with for marketing purpose. Whatever be the case, Blue Mail Media’s Thailand Business Executives List can be one of the great strategic resources to connect with your prospects via telephone, email or mail. Blue Mail Media has helped organizations from numerous industries connect with their target prospects and achieve greater response rate, conversions, and ROI in their marketing initiatives. Our team of data scientists, marketing experts and professionals follows a stringent process to ensure high accuracy of our database. 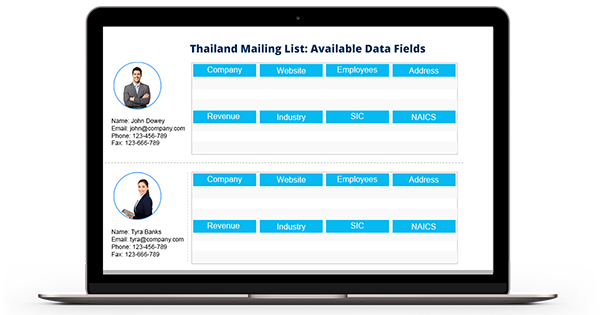 Also, our clients can choose from our pre-packaged Thailand Business Email Database or request a customized list that suits their requirements. Blue Mail Media’s well established data partners network across USA, UK, Canada, Europe, North America, APAC and other regions enables us to efficiently help clients beyond geographical constraints. We meticulously collect data from reliable sources, verify data for accuracy and update the same on a timely basis to ensure our database remains up-to-date at all times.